Casserole dish. I recommend getting a large oblong glass Pyrex baking dish such as the one pictured. Raw chicken. I prefer thigh meat, but any cut will do. Boneless or not, skinless or not, up to you. 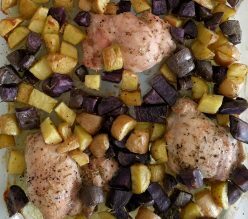 Frozen chicken is not recommended as it will take longer to cook and the other ingredients may overcook. Meat thermometer. This is not strictly required but to ensure the chicken is safe to eat, it should be cooked to at least 165 degrees F (74 degrees C) throughout. Potatoes. 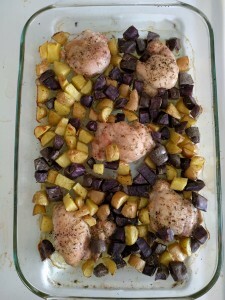 I like a mix of yellow, purple, and red potatoes. Try different kinds for variety. Cauliflower (optional). Green or Romanesco cauliflower is best in my opinion but regular cauliflower will do. Herbs and spices to taste. I prefer rosemary, thyme, garlic, and black pepper. Note: If, like me, you’re too lazy to go out to the supermarket to get the fresh ingredients, you might want to have them delivered by a service such as Farm Fresh To You. I get a small box from them every two weeks and it makes sure I always have fresh produce in my fridge. If you sign up, be sure to use the code WILL7967 for $10 off your order. Put olive oil in the bottom of the casserole dish. Chop potatoes and cauliflower (if used) into bite size chunks. Remember the smaller the size the faster it cooks. Optional: Parboil the potatoes. Potatoes can take longer to cook than chicken, so boiling the chopped potatoes for about 10 minutes prior to putting them in the dish can help. However, I’ve done this dish with raw potatoes several times without any problem. 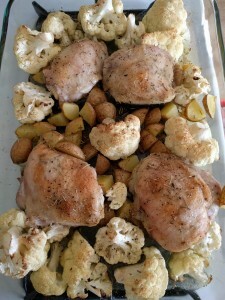 Place potatoes and cauliflower in the dish, and mix them around so they distribute the olive oil evenly. Place raw chicken around the dish. Sprinkle herbs and spices evenly over all. Drizzle some more olive oil over everything. This is the messy part. Using one hand (or wearing disposable gloves), rub the spices and oil into the raw meat. Turn over the meat a couple of times as you do this. Then wash your hand (or dispose of gloves) immediately, using the clean hand to work the faucet and soap. When the timer goes off, check it. It probably won’t be done yet. Use the meat thermometer to test if it is cooked enough, and/or use a fork to see if the chicken flakes easily and is not pink inside. If it’s not done yet, put it back in, setting a timer for 10-15 minutes to check again. Repeat the last step until as many times as needed. When it’s done, you’ll have a lot of food… pictured here are 5 servings worth. Serve up enough for one meal and stick the rest in the fridge for later!